Two suspect are in custody at the Sacramento County Jail after they were arrested in connection to the death of 6-year old boy. On February 12, at 6:53 a.m. the Sacramento County Sheriff’s Department Communications Center received a request from the Sacramento Metro Fire Department to respond to the 7300 block of Power Inn Road. Fire personnel indicated they had encountered a deceased child within a residence at that location. Responding Sheriff’s deputies began their preliminary investigation into the incident, which involved the death of a 6-year-old male. Sacramento County Sheriff’s Department Child Abuse Detectives responded, which is standard in all child death investigations. During their investigation, Detectives determined the circumstances surrounding the death of the child were suspicious. 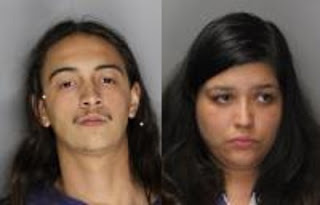 During the investigation Detectives developed probable cause to arrest 26-year-old Angelica Araiz Garcia of Sacramento and 22-year-old Miguel Roberto Uribe (above left) also of Sacramento. Both Uribe and Garcia lived at the residence and were arrested for charges pertaining to child neglect and child abuse resulting in a child’s death. Uribe was identified as the victim’s biological brother and Garcia was identified as Uribe’s live-in girlfriend. Both suspects are being held in the Sacramento County Main Jail. Bail for Garcia has been set at $500,000.00 and Uribe is being held without bail due to his charges. The identity of the victim, in this case, will be made available by the Sacramento County Coroner’s office after notification has been made to his next of kin. Both suspects are scheduled for arraignment on Wednesday, February 21. No Comment to " Two Suspects Arrested in Connection with Death of 6-year old "